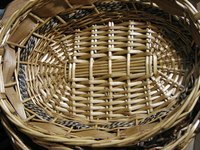 Whether it be the weave and materials or the decorations added, baskets are beautiful as well as functional. Lining a basket or any shape isn’t a complicated project. Oval baskets can be lined in about thirty minutes with the use of a sewing machine and moderate sewing skills. Add gathered lace around the edge by gluing the lace to the liner or to the basket rim. Make your basket liner pattern directly from your basket, instead of purchasing a so-so pattern, to ensure a perfect fit. Measure the depth of the inside of the basket and add 1-inch to this measurement. Measure the length around the inside sides of the oval basket and add 1-inch to this measurement. Cut a rectangle from tissue paper according to these measurements. This is the pattern for the inside sides of the oval basket liner. Place a piece of tissue paper over the basket opening and press the paper down onto the inside bottom of the basket. Use your finger to crease around the oval. Use a pencil to draw around the oval crease. Remove the paper and measure ½-inch around the oval tracing. Cut the oval pattern on this larger line. This allows fabric for the seam. Pin patterns on your fabric and cut one of the rectangle and the oval. Fold one long edge of the fabric rectangle over ½-inch against the wrong side of the fabric, and then fold it over again ½-inch so that no raw fabric edges are visible. Pin. Sew, using a ¼-inch seam allowance and a zig-zag stitch, along the pinned edge of the fabric rectangle. This is the hemmed top of the liner. Pin the two short ends together, with the right sides of the fabric facing, and sew the vertical seam using a 1-inch seam allowance and a straight stitch. You’ve formed a rectangle loop, which is the sides of the basket liner. Turn the rectangle loop inside out so you’re looking at the wrong side of the fabric. Turn the oval fabric piece over with the wrong side of the fabric facing you. Place the rectangle loop on a table so the hemmed top edge is touching the table (it’s upside down). Align the raw fabric edge of the oval fabric piece with the raw edges of the rectangle loop and pin together. Sew, using a ½-inch seam allowance and a straight stitch, around the oval and rectangle pinned edges, removing pins as you sew. You have sewn the liner. Insert the liner into the oval basket with the right sides of the fabric visible. Squirt a line of glue, with the glue gun, around the inside rim of the basket. Press the wrong side of the fabric liner hem against the line of glue. Allow glue to dry. Gathered lace can be glued to the hemmed edge of the fabric liner or along the rim of the basket.